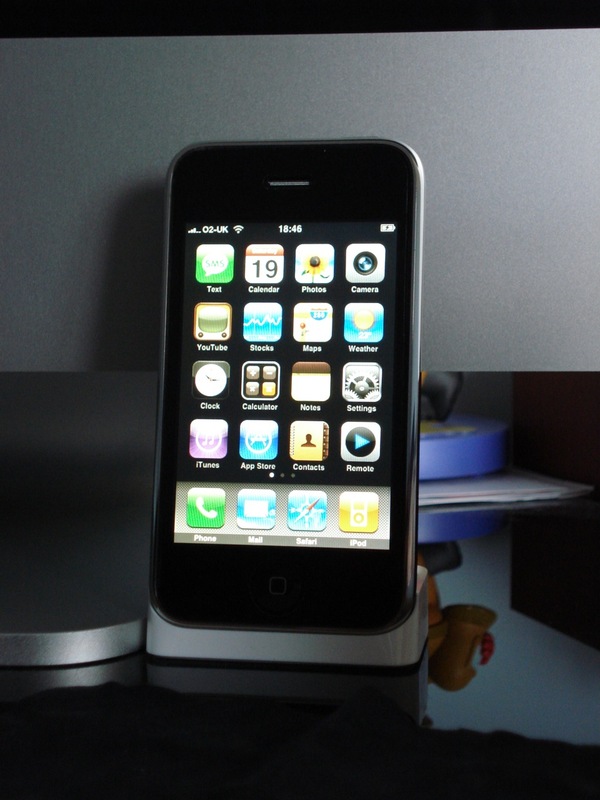 After months of waiting I managed to get a iPhone 3G on launch day. I have had an iPhone for a while now so I though I would give my impressions on it. First of it's a pretty good device and I really like the fact that my contacts, email, photos, music and podcasts are all on one device. I have however had a few problems with GPS which resulted in a few big problems. I went for the iPhone as 3G coverage in my area is pretty good and had pretty much all the features I wanted in a phone and my old phone (Nokia N73) was starting to get very buggy as it kept taking a minute or so to move from the text message screen to the home screen. I had no real problem using my finger to navigate the screens, menus or applications. Even my stubby hands were able to use the on screen keypad after a little while I got use to it and I now almost always select the right key. The web browsing on the device is great and probably the best thing about it. I can be anywhere and surf the net. There are a lot of good iPhone enabled websites which make reading pages and navigation very easy but for the majority of websites navigating and read them is not a problem as the zoom/pinch function allows me to zoom into a block of text and read it at whatever size I want. I am also glad that O2's tariff allow for unlimited data access (although it does have a fair use policy) which means I don't need to worry too much about data charges when surfing the net on 3G or EDGE and O2 didn't increase their tariff's to include 3G, so well done O2 and keep it up. I use exchange for my personal email but all my contacts and calendars are stored in Address Book and iCal on my Mac. The iPhone was handle this odd arrangement without any problem so I can now send and receive emails from anywhere and I can quickly check. The phone audio quality is decent. I would say my old Nokia N73 was slightly clearer but the iPhone's phone audio quality is fine. Photo's look very nice and the pinch action makes zooming in and out of photo's a breeze. I haven't watched too many YouTube videos yet but clips look really good on the iPhone. I had a quick look around the app store and too be honest I can't really see many applications that I may want. I don't really want to use the iPhone as a gaming device so and I spent a lot on technology stuff recently so I don't have much spare cash left to pay for applications so that left me small selection of free applications. I do really like the Last.fm application as it a great way to find and listen to music and the Remote app is also useful as it lets me use my iPhone as a remote control for my iTunes library and my Apple TV. The iPod feature on the iPhone is fantastic. The audio quality (from the headphone connection) is not as good when compared to my 160GB iPod classic but it's still good. The audio quality from the iPhone's inbuilt speaker isn't too loud but this is a feature I would hard ever use. Video playback is vastly better when compared to my iPod and picture quality is very clear for a mobile device. The iPhone's accelerometer means you can watch videos in a widescreen..ish (it's not 16:9) format. The only problem I have with the iPod feature in the iPhone is that there isn't enough room on the 16GB Solid state drive to fit all my stuff. As all my music is ripped to Apple Lossless it takes up a large amount of space to store a few tracks on the iPhone. I have synced all my podcasts and several playlists to the iPhone but I still take my iPod Classic with me to work so I can listen to whatever track I want to while at my desk. The iPhone is very prone to finger print marks all over the device and the supplied cloth is used a lot and pretty much goes where the phone goes. I was also very worried about scratching the front so I stuck on a protective cover to the front called invisibleSHIELD which after drying out isn't too noticeable and stops me from worrying about scratching the screen. I did however have a few problems with the iPhone. The main issue I had was that the GPS was not working. It could not find my location no matter where I was. I could not get GPS to work on my iPhone and I went over a load of stuff with Apple support including turning thing off and on, resetting network settings and restoring the firmware but I still can't get it to work. When on WiFi or Edge it did pinpoint my location but it thought I was in the sea near Canada which is strange as I was in Milton Keynes (England) at the time. Firstly I tried several different locations near where I live. Including vast open areas such as fields and lakes (no trees or buildings blocking any view to the sky), built up city centres, outside my home in my garden and in a car on an A road. I also tried these locations with a TomTom 520 and the TomTom spotted my location within a few seconds. I also tried several different setting like having 3G on and off and WiFi on and off. I tested with different firmware (if you do a restore in iTunes the version number goes up from 2.0 (5A345) to 2.0 (5A347)). I tried resetting the network and carrier settings. I made sure that the date/time and international settings were correct for the UK (according to Apple these need to be correct otherwise when it tries to compare times with the sats/servers and they are vastly off it won't work). I have turned off all radios and tried and then just turned on location services. After several calls to Apple Support and having my phone replaced, I found a strange trick on the AVForums (big thanks to AVForums and coops233) website that made it work, turning the Auto-Lock to never. I am not sure how Auto-Lock is related to GPS but turning it off testing GPS and then turning it back on worked! Now that GPS works the Google Maps application is great. You don't get turn by turn directions but it does pinpoint where you are. The other problem I currently have is that when I play a podcast from start to finish on the iPhone it does not register as played on iTunes and I still have not found a solution to this. Other than the problems I had with GPS and marking podcasts as played the iPhone is a great phone. Nokia phones are the best phone investment that you could make. Year after year they have been providing quality phones for consumers. Unfortunately the new Nokia phones can cost you an arm and a leg, especially an unlocked Nokia N73. I found a great site to find unlocked Nokia cell phones from auctions. I bought 2 Nokia N73 cell phones for me and my wife, and we love them. Check them out at Unlocked Nokia Cell Phone Auctions. Just my 2 cents. The majority of phones I have owned in the past have been Nokia handsets and they were great handsets. I still know lots of friends and family members with N73's or want a Nokia handset with a Symbian OS so I'll pass on the link.